Geotagg is an IITM Alumni Startup. They were in the IITM Incubation until recently when they raised INR 1 crore and graduated. They have a team of 10 people working on the mobile app Raft. This application gives up-to-date information on public transport in Chennai. It was co-founded by Lathy, Shreya and Dixcy, who lived in Mandakini hostel during their institute days. Akhilesh “Lathy” Koppineni is a tech freak who would love to have chicken for every meal. Also, he is the one who does the most of talking during our interview with the team. Siddharth “Shreya” Krishnaswamy wants to work on upcoming fields such as mobile app development, and dreams of becoming a coffee connoisseur as well. Both of them have worked at Sabre and have visited more than 10 countries by far (that’s simply amazing, isn’t it!). The third one, Krishna “Dixcy” Chaitanya, is a shopaholic who loves to keep track of the latest developments in the world of cars and gadgets. The day he graduated, he was into the world of startups as a part of the team at MyParichay. We had an amazing talk with them at the IITM Incubation Cell at IIT Madras Research Park. 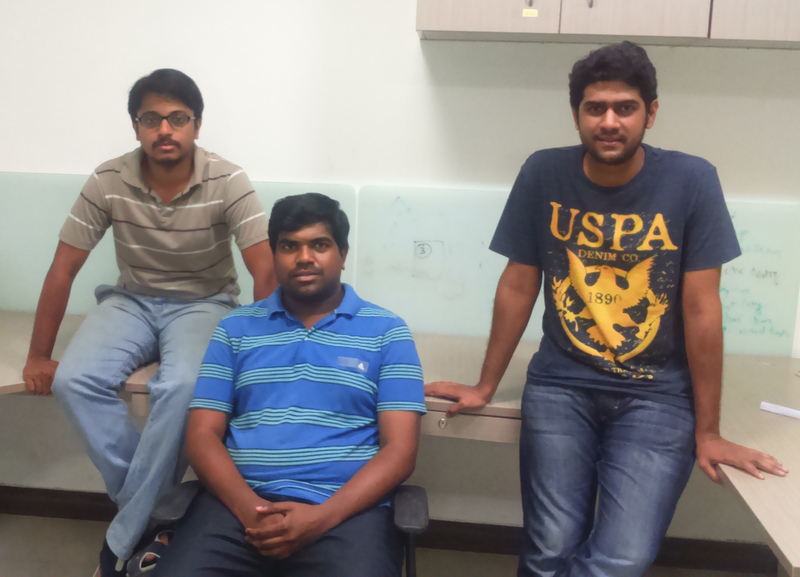 They founded the company in April 2014 and got incubated at IIT Madras Incubation Cell. They raised their first round of funding in November and now have a separate office space at the Research Park. They are into mobile applications development and their area of interest is the urban transportation sector. They are in love with what they are doing and the enthusiasm with which they talked about their first product, Raft, was an evidence of that. Raft is for people who choose to travel around using public transport. “You just have to tell the starting point and the destination and this app will give you multiple options. We cover MTC buses (both AC and non AC), all the MRTS train routes and will soon be covering metro routes, whenever it launches”, explains Akhilesh. give an idea about the traffic congestion in an area and then telling the user about the best available route”, Akhilesh adds. Faced with multiple challenges, they could come up with many unique features in their app. They have accurate details of close to 6000 bus stops and all the railway stations in Chennai. “In Google’s apps, you will probably find data of only about 30-40% of the bus stops which actually exist in a city like Chennai. It means if we are 100% today then there is only 30-40% data out there. There was no platform before which had this kind of information. Chennai MTC changed around 50 bus route numbers in February and Google Maps still shows the old numbers. Raft was able to update immediately as there were data collectors on the ground and there is no other platform on mobile which can track such changes”, we could see pride in their eyes. As the talk proceeded they gave us a brief insight of the algorithms they use to make their app work. “In the back end we create a graph of the city using information such as bus timings and traffic and then based on the user’s origin and destination we calculate the fastest three routes using our algorithm”, spoke Krishna for the very first time. They have a well-structured team. Apart from the three of them they have a technical team and a team of data collectors. They also take interns regularly. IITM Incubation Cell has helped them a lot by giving them office space and right guidance. They have two professors from institute as their technical advisors. “Also, if someone else is already doing something related to your idea, that shouldn’t discourage you. There will always be somebody trying to do exactly what you’re doing. It’s all about doing it differently. Competition shouldn’t scare you, rather it should bolster your confidence, because it means someone else also believes in the same idea that you do”. We believe this is the most inspirational piece of advice they gave. They have a clear target in mind. “By the end of this year we want to have presence in at least 10 Indian cities with at least a million people using our app. It’s challenging, but we’ll definitely be able to achieve it. We just have to take it one step at a time”, said Akhilesh with confidence in his voice. He also tells us that publicity and marketing is one of the most important part of a startup. In their case, most of it is through word-of-mouth. However, this is obviously not enough and therefore they have been running social media campaigns for the past two months. He adds that publicity and marketing are the key elements in making a startup successful. “We didn’t have access to the research park, incubation cell or any remote access to anyone who had started a company. That’s one of the reasons why we’re doing this interview. Students in the institute are not aware of the startups which have been founded by the alumni. They should have someone to reach out to. If there’s anybody who’s interested in talking about startups, we’re ready to share our experience”, they said to end the wonderful conversation. The app is available at app.letsraft.in. It was launched around Christmas last year and already has close to about 10000 users.